Robert Kyagulanyi addresses journalists at his home in Magere, Wakiso District. Kyadondo East member of parliament Robert Kyagulanyi has warned President Yoweri Museveni to come to the realisation that there will be a time when he will not be in power. Kyagulanyi also known as Bobi Wine said, Museveni should treat Ugandans the same way he would want to be treated once he is out of power instead of brutalising them using his security forces. Bobi Wine was addressing his first press conference at his home in Magere, Kasangati since his return from the US - where he spent at least 19 days seeking further treatment. Kyagulanyi said he would want to be in President Museveni's mind to know how it feels like to brutalise fellow citizens without a care in the world. "How does it feel to treat your people like this? Mr president, how does it feel to continuously press your boot on the necks of your people. Many times you have reminded us that you're a Jajja, our grandparent...Grandparents are always people that we ran to for love, for protection." Kyagulanyi said. He cited the August 13 incident in which, his driver Yasin Kawuma was shot dead by his assertion, soldiers of the president. Further, him (Kyagulanyi) and about 32 others, he said, were brutally arrested and tortured, and yet instead of bring the perpetrators to book, the president according to the MP, only patted the soldiers on the back for a job well done. He added that he was blocked from visiting his grandmother in Najjanankumbi on Thursday last week when he jetted into the country. "We're indeed grandchildren of Uganda who also have a brain and have a voice. I believe that a grandparent should not be brutalising or framing grandchildren every time they try to raise a voice." he said in reference to what has been termed as 'trumped up' treason charges against Kyagulanyi and 34 others. The suspects were arrested on August 13 and 14 in Arua on allegations of stoning President Yoweri Museveni's convoy. Kyagulanyi said, just like in the biblical times when the pharaoh of Egypt was asked by Moses to let the Israelites that he'd enslaved for so long free, President Museveni should also let Ugandans free. "Remember just as there was a time you were not in power, there will be time when you will not be in power... It's not too late to listen to our cries... please do what is right...Let Ugandans free, let them go." he said. He said he's encouraged by the new energy sweeping across the country - where citizens are demanding back their power and throwing all previous fear out of the window. According to Kyagulanyi, the evil meted out by the state unto its own citizens during the Arua incident, has turned out to be a 'good evil' - with the eyes of the world now focused on Uganda. "The evil the enemy intended to do turned out to be good. It went ahead to open our eyes to the brutality. For so long the government has portrayed Uganda as a democratic country," he said. "We must stand together. We're in this together - this is not about a single person, we cannot just sit back and continue to watch with shock the disturbing videos of the security officers of the police, military brutalising the people they are paid to protect... I can tell you that regardless of how comfortable you think you're, the injustices you see in a distance will eventually come to you... The injustice that you see on your fellow Ugandans is a threat to you." Kyagulanyi said. He had praises for the media for acting professional amidst state brutality. He said while they are indeed doing their job, they also have a responsibility to contribute to the liberation of the country. "I have seen so many of you [journalists] act professionally even in extreme danger. I was so so humbled by the journalist [Allan Aturinda of BBC] I saw trying to save a life a guy I learnt to know was 'Sweet Pepsi' brutalised by the army putting on a uniform with our a national flag which is supposed to be an emblem of honour but this journalist did something that continues to challenge me." he added. A video showing an unruffled Hannington Ssewankambo aka Sweet Pepsi with blood profusely flowing out of his head being clobbered by presidential guards in Kasangati, became a social media sensation last week. 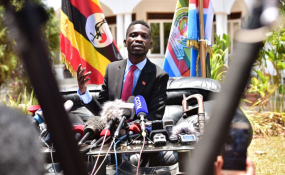 Kyagulanyi asked the international community to focus their lenses on Uganda as it goes through an important political stage. "Don't take your eyes off us, we don't want to be crying in the dark. We don't want to be suffering in the dark... .we want the world to know what is happening in Uganda... the regime here has been able to commit so many atrocities against citizens and has been smart enough to come off as a democratic regime until recently. The more you keep your cameras on us, is the more this regime is going to be exposed as good or bad. So please project our good and also project our challenges." Kyagulanyi added. Kyagulanyi said while it appears like all the security personnel were against Ugandans, he said he's talked to many of them who don't approve of the ongoings in the country. "I must also note that we have very many professional and patriotic ladies and gentlemen in the security forces. I have interacted with so many of them from the top to he lowest levels, and many of them, have intimidated to me; they are frustrated by the way the system operatives. They don't want to continuously be a shame to the uniform they put on. They put on our uniform, they want it to be a national badge of honour, not a national badge of criticism." he said. "So much as many of them are being pushed to brutalise the innocent citizens, much as many of them are being pushed to do what they don't believe in. I want to commend those ones that continue to stand by the values that they were trained with. And I want to continuously to call them, to be the voice of reason wherever they are. And to those brothers in uniforms, I want to remind that they are Ugandans before and after they put on that uniform... Please stand on the right side of history and I will also challenge you to go through history to see what happened to the people that behaved the way you behave. Don't be forces of fear, don't be forces of terror be forces of friendship, be Ugandans." he added. For those in security forces, who, he said continuously brutalise Ugandans and step on their freedoms, he reminded them that the People Power movement is not fighting them but rather "fighting for you because we know that even the brothers and sisters in the military and police go through the same challenges like us everyday." Kyagulanyi said he's disturbed by the fear and tension exhibited by the state when it turned the country into a military zone on Thursday last week even after dismissing the People Power movement as inconsequential and jus full of hoodlums from the ghetto. The army heavily deployed in Entebbe, Kamwokya and Kasangati to disrupt any homecoming celebrations for the legislator. Several people who'd lined the roads to welcome back the legislator were brutally beaten while so many got arrested. Journalists were arrested and blocked from accessing the airport. Kyagulanyi said it's not too late for Museveni to "be true to his words, the words that we were so proud of when we were growing up. To be a statesman and not a politician... A politician cares only for the next general election but a statesman cares for the next generation... I want you to remember that just like us there was a time when you were not in power. There was a time when the former regimes, the regimes you discredit every now and then - particularly in the 80s called you bandits when you were fighting for freedom although you were fighting violently and we don't believe in violence." Copyright © 2018 The Observer. All rights reserved. Distributed by AllAfrica Global Media (allAfrica.com). To contact the copyright holder directly for corrections — or for permission to republish or make other authorized use of this material, click here.